SDCC was last month, and despite not getting tickets in the first round, I did manage to get a ticket again this year! I debuted a new full cosplay and a new pseudo-cosplay, which was very fun. Antonio, gem, and I drove down Wednesday after work and had Berkeley Pizza for dinner. It was a short night, because we didn’t get down there early. 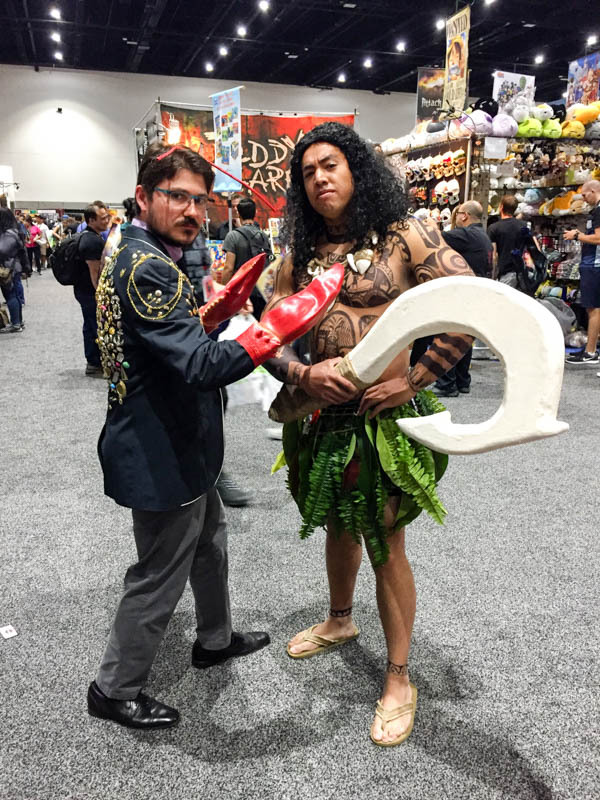 Thursday was the first time I wore my Tamatoa (the crab from Moana) cosplay. It was way too hot for it, but I enjoyed wearing it. We met up with Tram and her friend Christian, and we spent most of the day with them. Maybe they’re good luck, because we got into Hall H for the first time. For reference, usually people line up overnight to get into Hall H. We heard an announcement that Will Smith would be in Hall H, which I just found silly. So what? It’s too late now. Antonio pointed out that maybe they announced it because it wasn’t full. He was exactly right. We walked right into the Netflix panel about Bright and Death Note. Will Smith was on the first half of the panel for Bright, and the whole thing was moderated by Terry Crews. It was pretty cool to be in there with them! 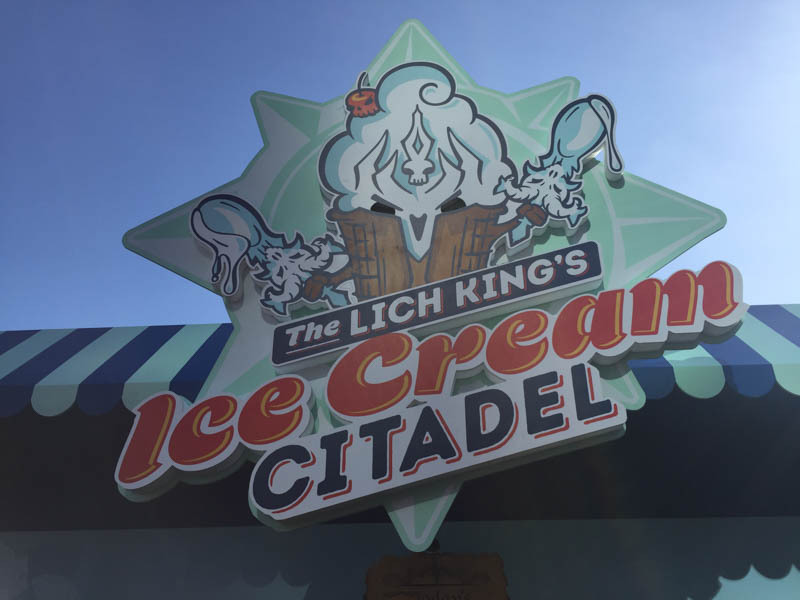 After Hall H, it was time for the Lick King’s Ice Cream Citadel! We got some tasty ice cream and posed with the Lich King! 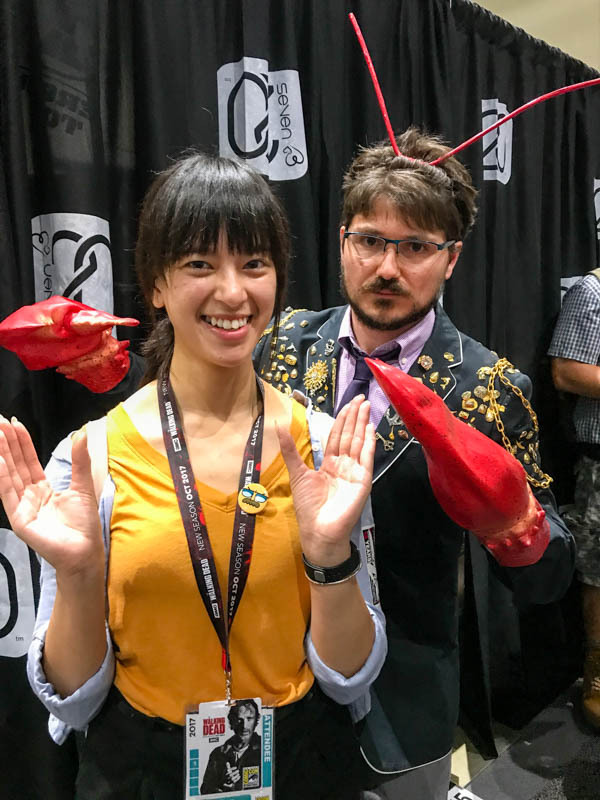 By then I was tired of my Tamatoa costume, so I changed into normal clothes because it was so hot. We had Greek fusion for dinner at Meze, at which we ate the last two years as well. On Friday I wore my Magikarp Jump cosplay. It wasn’t 100% authentic at all, but it was fun. gem had the idea to use Boomerang for the video. Nice suggestion! We met up with our friends Krista, Kaitlyn, and David. I always run into Krista and Kaitlyn at the coolest places! This was a day mostly for panels. I saw Robin Hobb: Beyond the Page first followed by Dare to Be Dynamite: Creative Vision with Pierce Brown, an author that gem loves. In the evening we watched a Mega64 panel and the Super Geeked Up Improv show, which was fun, although I wish there was more improv. My favorite panel was Superstars in Children’s Fiction with Greg Grunberg, Lucas Turnbloom, R. L. Stine, Jarrett J. Krosocka, Jenni Holm, Matt Holm, and Molly Ostertag. 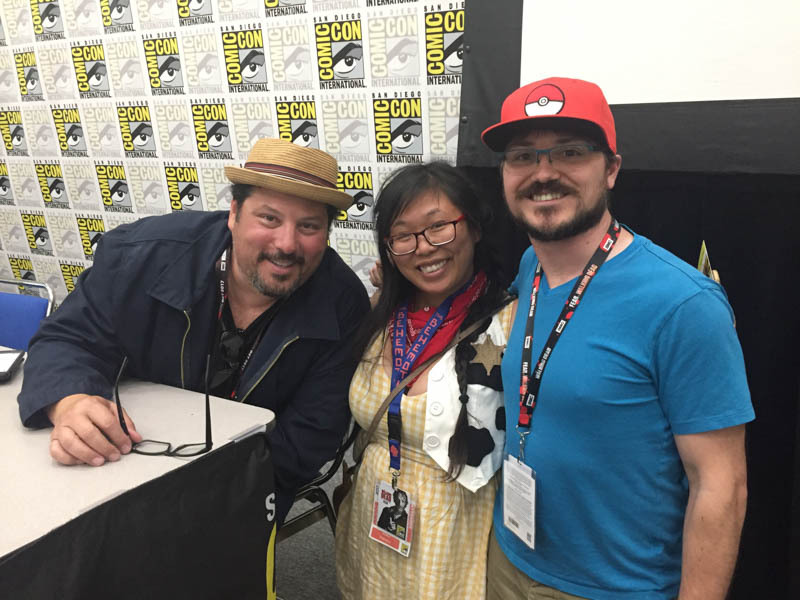 We went because we thought it would be fun to see R. L. Stine, but we had no idea that Greg Grunberg, Parkman from Heroes and Wexley from Star Wars: The Force Awakens, would be there and is now a children’s fiction author. He was super nice! We chatted with him after the panel, and when I asked to take a photo of him and gem, his son (I think) offered to take one of the three of us. My favorite part of the panel was when Greg asked R. L. Stine about the future of Goosebumps TV shows or films. R. L. Stine said he couldn’t comment. Greg told him that he’d trade him information about the next Star Wars movies. Too awesome. 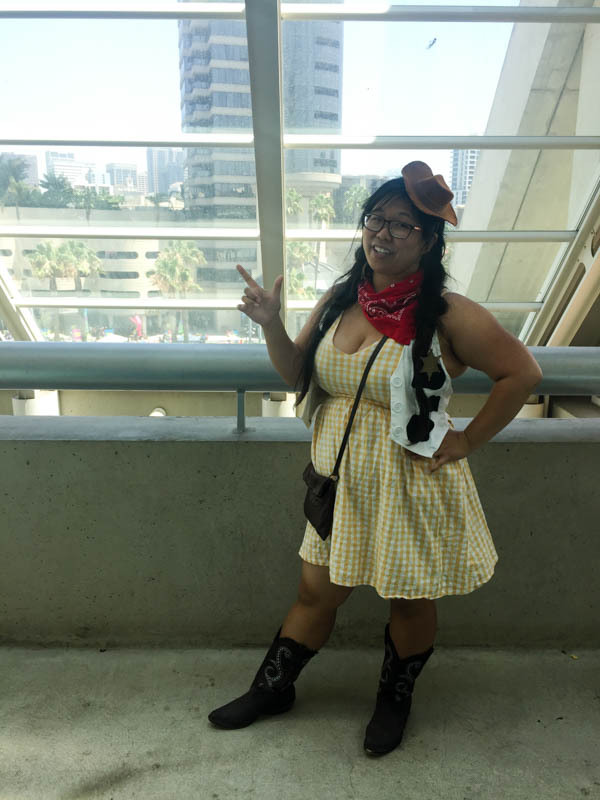 gem wore her Woody costume, which was modified since last year. Previously she tried to keep it authenticate. This year it was more interpretive with a dress. I think she rocked it! On Saturday, Antonio and I snuck in as professionals to skip the line. Yay. 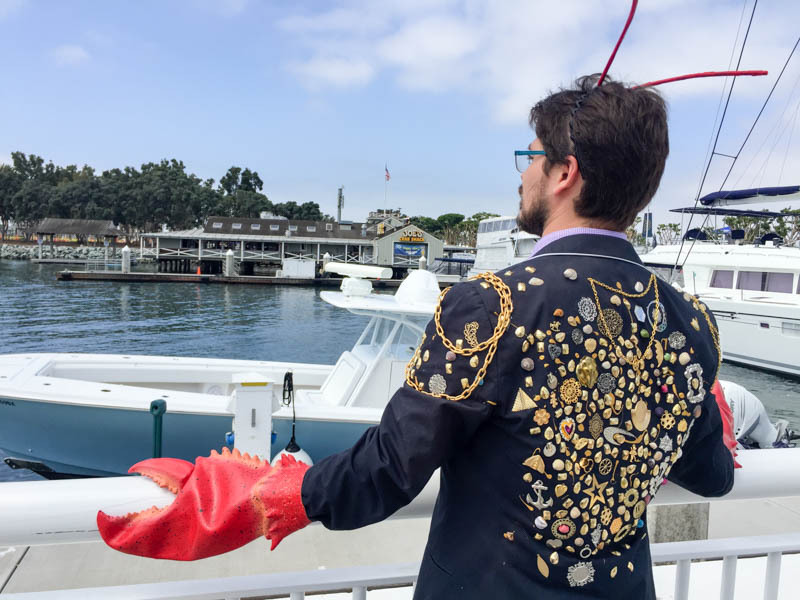 gem took some cool photos of me by the water in my Tamatoa costume. 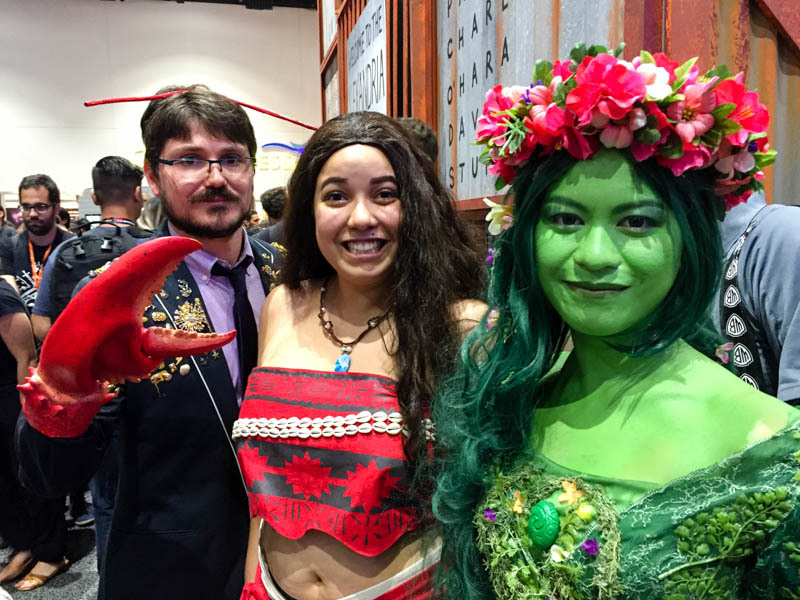 There were a lot of great Moana cosplayers! Thanks to gem for taking so many wonderful photographs 🙂 There are more on my cosplay page. 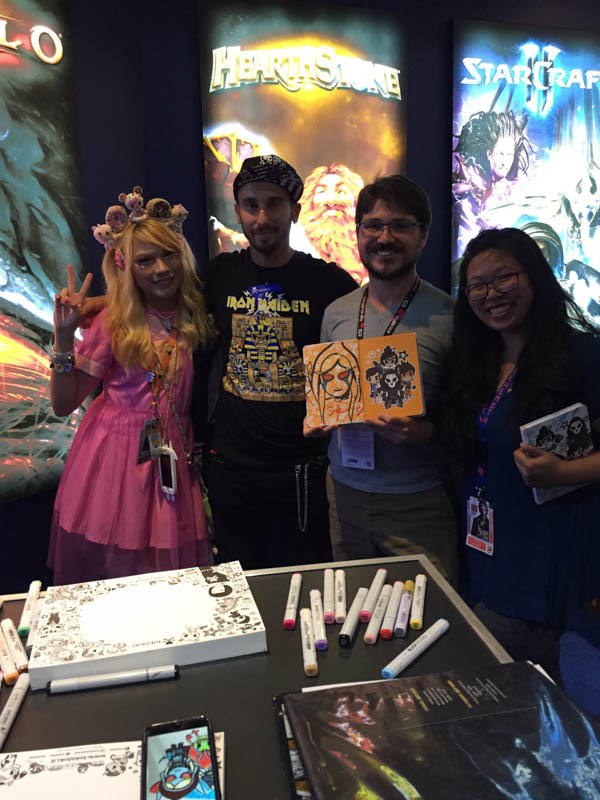 We went to another tokidoki signing as always where Simone signed my tokidoki x Overwatch notebook. We also chatted with Jaycee, who worked for tokidoki. She remembered us from previous years, and we followed each other on Instagram. Let’s not talk about waiting in line over an hour for a Star Trek panel but not getting inside. At least I got to chat with some cool people in line! Kaleigh joined us that night, although we split up for a bit. gem and I hung out while Antonio met with her at the train station. We all met up briefly, but then that evening gem, Antonio, and I went to see the best brothers around, the McElroys! We watched My Brother, My Brother, and Me live in San Diego! It was really fun to see them in person. Too bad we didn’t get to talk to them. I had a question ready to ask, but there weren’t microphones on the balcony where we were sitting unfortunately. 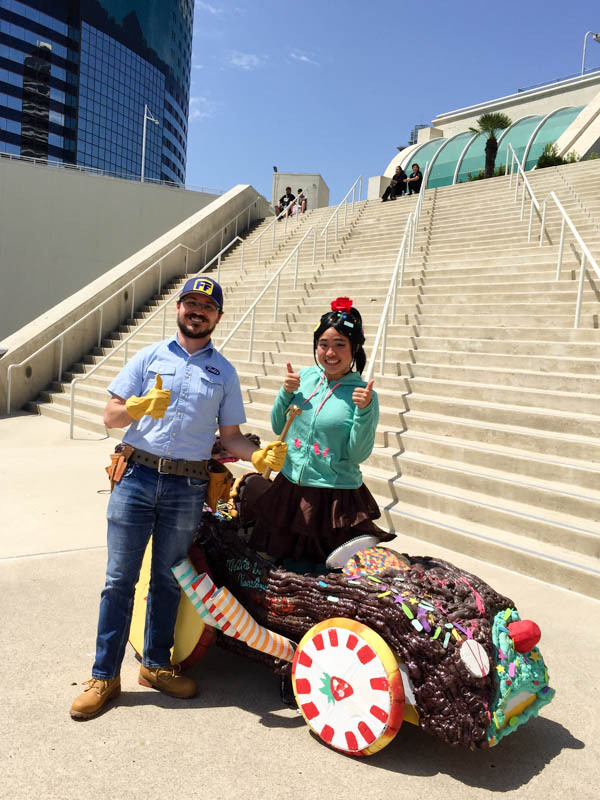 On Sunday I wore a tried-and-true cosplay, Fix-it Felix Jr.! During a panel, I ran into Erin, a Vanelope von Schweetz cosplayer! We took some photos together after the panel. Her car was super amazing! After chatting with her, we went to a Disneybound panel with Leslie Kay, Kit Leitmeyer, Loni Clark, Neil A. Williams II, and Sara Katz-Scher. It was pretty interesting to hear about how they come up with their outfits. 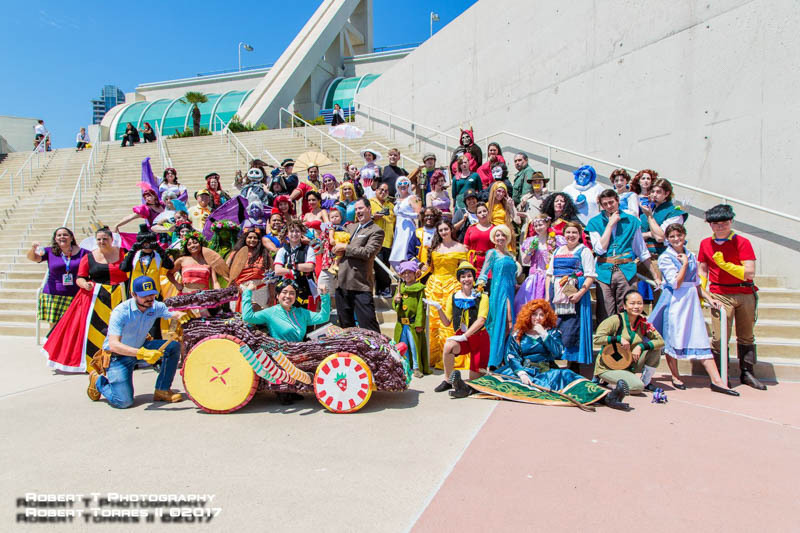 I ended the convention at the Disney group shoot! It was organized by Robert T Photography, who also took the photo above. You can see more of his photos from the event here on Facebook. One videographer took video of us for the end of his cosplay music video. I’m in it briefly at the end as I dance around 4:51, but I’m right in front so you can see me clearly, haha! 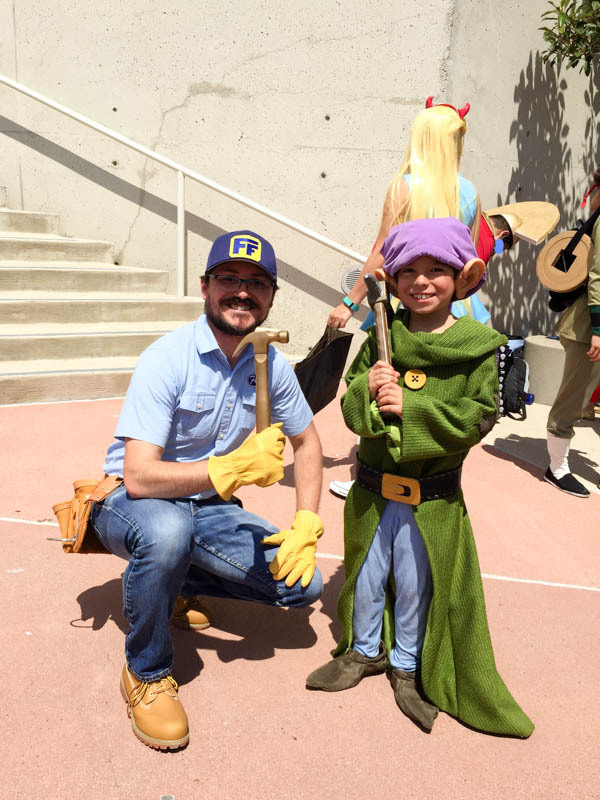 Look how amazing this little Dopey cosplayer was! He seemed to have a great time with the other Disney cosplayers. Antonio took this photo of me and gem in her Steven Universe cosplay! I think she did a great job with this. 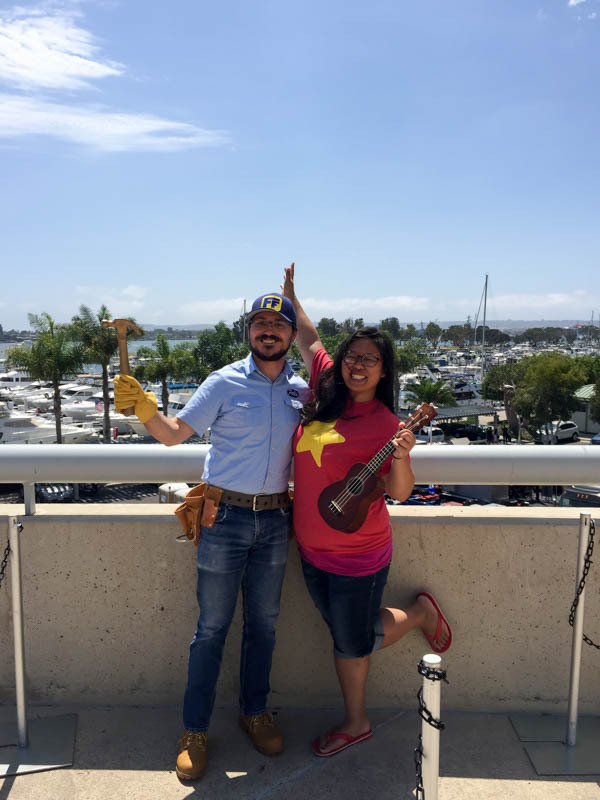 A lot of Steven Universe cosplayers carry a ukulele just as a prop, but this cosplayer can actually play it! Yeah! There are plenty more photos of my Fix-it Felix Jr. cosplay here. On our way out of San Diego, we stopped at Kafe Sobaka Restoran Pomegranate for Russian dinner. 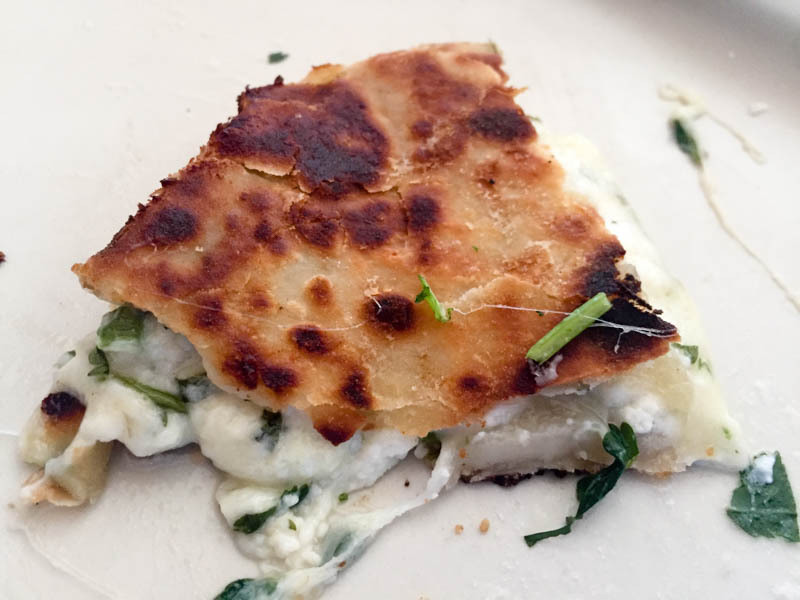 This is the khachapuri, which was filled with delicious cheese. Oh my god, I definitely need to eat this again. I also had chanakhi (lamb stew) as my entree. 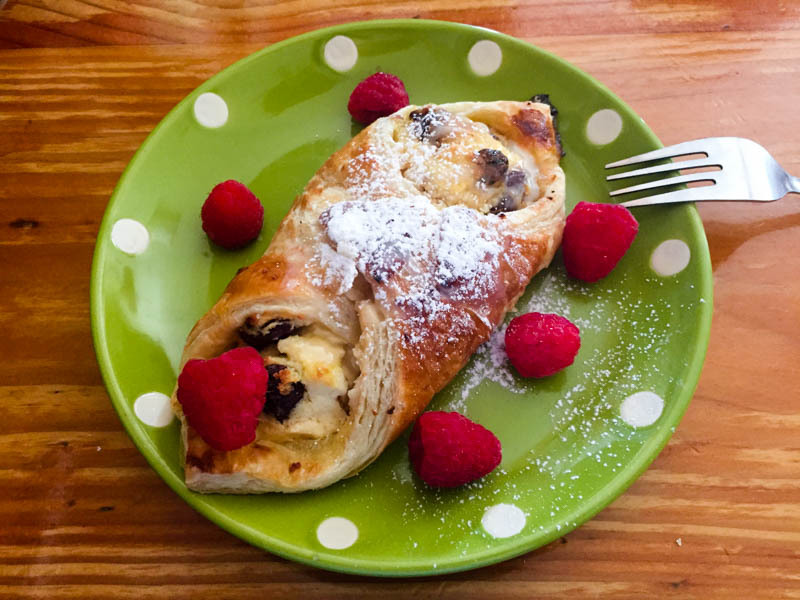 And for dessert, I had sweet vatrushka with sour cherry and farmer’s cheese. Yum! This entry was posted in Anime and Manga, Books and Literature, Comedy, Comics, Conventions, Costumes, Creations, Events, Food, Gaming, Journal, Movies, Photos and Screenshots, Shows, TV, Vacation, Videos, World of Warcraft and tagged Berkeley Pizza, Bright, comic-con, cosplay, costume, Death Note, fix it felix, fix it felix jr, food, Greg Grunberg, Heroes, Kafe Sobaka Restoran Pomegranate, mbmbam, Moana, R. L. Stine, russian, san diego, San Diego Comic-Con, San Diego Comic-Con 2017, sdcc, SDCC 2017, Steven Universe, Tamatoa, Terry Crews, tokidoki, Will Smith, wreck-it ralph on August 5, 2017 by TheUser. 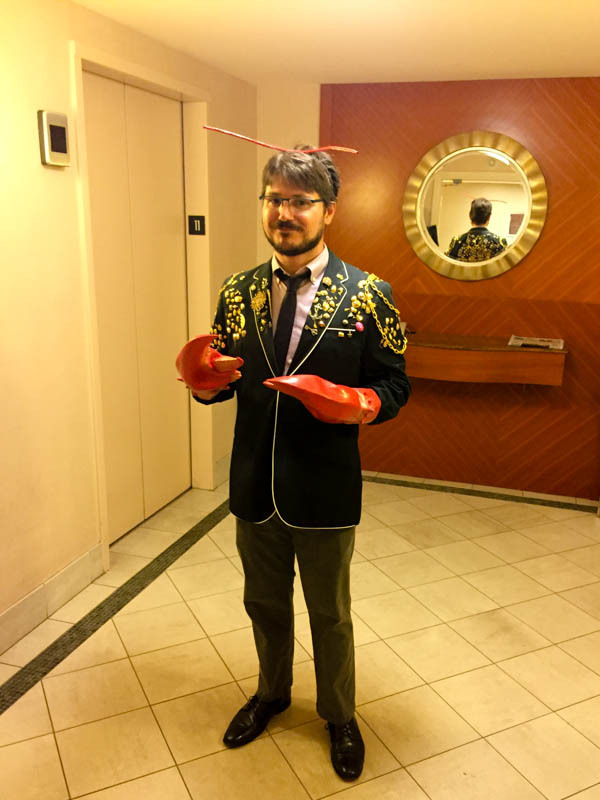 2015 blogging in review | WebPageless on Legendary Star-Lord is Super Rad! Do I look like a pirate yet? Dolly and Dot’s great escape!